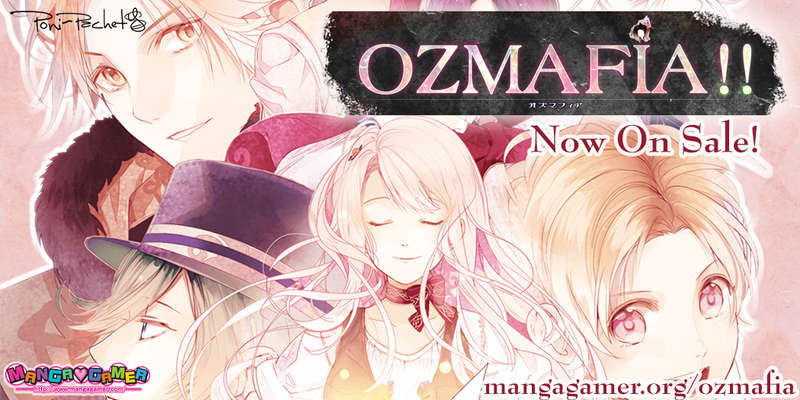 Our very first otome game, Ozmafia!! is now on sale on MangaGamer.com! It’ll be unlocking on Steam in just a few hours! Follow Fuka (or whatever you fancy calling her) as she tries to navigate a magical land full of fairytale personalities and mafia conflict––with no memories, no less! What will you find at the end of the path you decide to have her take? Friendship? Love? …Or tragedy? Update: If you downloaded Ozmafia!! from our store prior to May 3rd, 4:30pm EST, we have a patch for you to correct a few little bugs and script errors, just download it and unzip it into your game folder. If you got the game on Steam or downloaded it from us more recently, you should already have the updated version of the game. Thank you to everyone who reported issues so we could get those fixed! « Kindred Spirits Drama CD Vol 1 Now On Sale! make sure you make a copy of your save folder before copying and pasting the patch or all of your CGs will disappear. I’ve heard good things about this game but I have no interest in straight romance. Are any of the LIs girls?